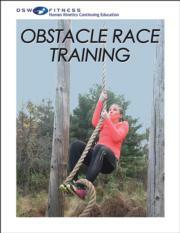 This comprehensive course prepares you to help athletes conquer the demands of obstacle course racing. From grip strength to balance, the exercises and workouts address the unique challenges of this popular sport. Obstacle course racing is one of the fastest-growing sports in the United States in recent years and has gained in popularity around the world. With challenges such as scaling walls, crawling through mud, climbing ropes, and sprinting across rugged terrain, the sport is grueling and demanding. But for those who prepare, train, and know what to expect, it is also intensely satisfying. Based on the book Essentials of Obstacle Race Training by David Magida and Melissa Rodriguez, this in-depth course breaks down the events, obstacles, common difficulties, and strategies for negotiating all challenges. Most important, it presents the tools to prepare athletes—physically and mentally—for the unforgettable adventure that awaits. The Obstacle Race Training course presents 80 of the most effective exercises for grip strength, mobility, balance, power, strength, and endurance as well as 30 ready-to-use workouts. You’ll also find advice on conquering course challenges, preventing injuries, selecting events, and using mental strategies to gain focus and overcome fear. Discuss the risk factors of obstacle racing and the training strategies employed to minimize these risks. Explain how obstacle racing benefits physical, mental, and emotional well-being. Identify the energy systems used in obstacle racing and the role each system plays in racing success. List appropriate gear and discuss gear selection for a positive obstacle racing experience. Describe the strategies for effective fueling of the body before, during, and after the race. Differentiate between exercises and exercise training programs designed for the development of strength, power, endurance, mobility, and balance. Design a safe and effective obstacle race training program. List the key factors involved in selecting the appropriate obstacle race. Discuss the value of mental toughness and strategies to increase mental toughness to increase race readiness. List the final prerace steps, from two weeks prior through race day. The study guide includes a course syllabus, learning objectives, learning activities, and a referenced answer key. The study guide highlights the key concepts of the book in order to prepare individuals to pass the 50-question exam (composed of multiple-choice and true-or-false questions) at the end of the course. Whether your clients are competing for their first or their hundredth event, preparation and confidence are key. With Obstacle Race Training, you’ll help them conquer every challenge. David Magida is the founder of Elevate Interval Fitness, which provides group classes focusing on high-intensity interval training. Magida is certified as a group fitness instructor with the American Council on Exercise and has spent years teaching obstacle race training classes. He regularly provides expert commentary on obstacle race training for Men’s Fitness. He is a founding member of the Spartan Race Pro Team and serves as a host of Spartan Race on NBC Sports. Magida has been racing OCR since 2011. In only his second race he reached the podium for the first time and realized he had found his calling. That day Magida realigned his focus from training for road running and triathlon races to training for OCR. Over the next two years, Magida ranked in the top 10 nationally in the Spartan Race Points Series (finishing ninth in 2012 and fifth in 2013) as well as other race-ranking systems. He was one of the first 10 men in the United States to receive professional status. With 17 podium finishes and 7 victories in Spartan races during his career and more than 30 podium finishes in OCR events, including more than a dozen victories, Magida has consistently proven himself to be a threat every time he steps up to the line. Magida operates Elevate Interval Fitness facilities in Washington, D.C., and Northern Virginia. He has also been a guest blogger for the Spartan Race Blog and Obstacle Racing Media. Melissa Rodriguez is a fitness trainer, industry analyst, and obstacle racing enthusiast. She has held a personal training certification through the National Academy of Sports Medicine since 2003 and a certified strength and conditioning specialist designation from the National Strength and Conditioning Association since 2005. Although she trains clients with a range of fitness levels and athletic goals, she has a passion for coaching beginners. Rodriguez also has undergraduate degrees in English and biology as well as a master’s in business administration. Since 2008, Rodriguez has served as a research analyst, report writer, and project manager for the International Health, Racquet & Sportsclub Association (IHRSA). As IHRSA’s senior manager of research, she regularly presents research findings and opportunities at national and international conferences and is a regular contributor to IHRSA’s Club Business International magazine. In recognition of obstacle course racing’s potential, Rodriguez started following the sport in early 2011 when she trained and prepared a client for the Tough Mudder race. Since then, she has maintained a blog on her website, MyExerciseCoach.net, which offers fitness and training guidance focused on obstacle course racing for beginners. She also maintains ObstacleRaceWorld.com, a website dedicated to tracking and analyzing the business of obstacle racing. Rodriguez is the author of the book 12 Weeks. 22 Workouts. Your First Obstacle Race and Obstacle Race World: The State of the Mud Run Business, the first-ever industry report on obstacle racing.